"Str. testae labro crassissimo, anfractu primo verrucis coronato; interstitiis verrucarum plicatis, altero transversim costato, reliquis transversim striatis." (Addition:) "testa crassa 5 1/2 pollices longa, 5 lata, saepius lutea, et inter verrucas rosea." Comment Ulrich Wieneke: Gmelin is citing Listers picture of Lobatus gigas, if pl. 863 is correct. 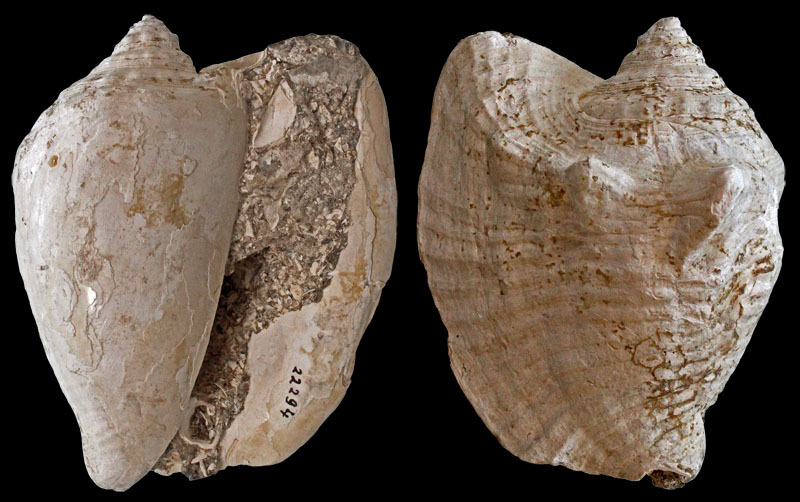 This plate is the third shell shown as fig. 18 (There is no numbering on the plate, but 861 show fig. 18, which is in Martinis Numbering system 18a, 862 (no plate numbering) would be 18b and 863 18c). Martini also named it: "Das gerippte dickschalige Lapphorn" and "Der Habichtsflügel"
Syn. 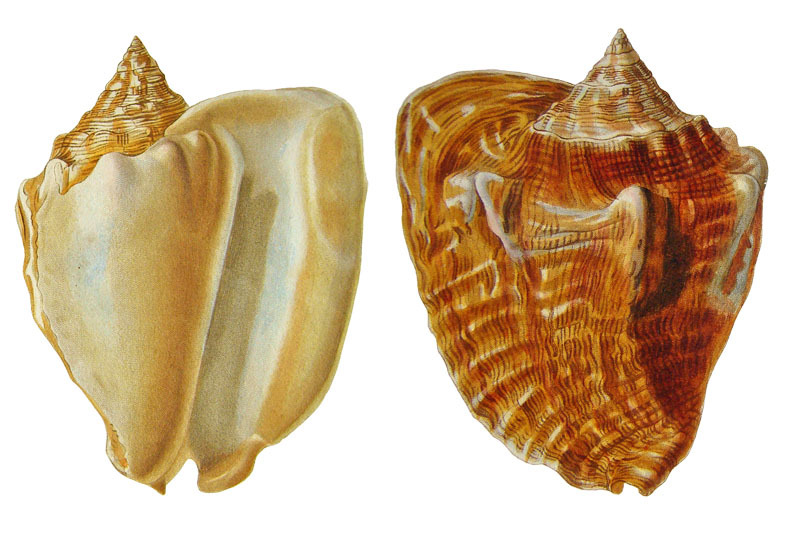 : Strombus costatus aguayoi Jaume & del Valle, 1947: 9, 10, figs 1, 3. "L. Accipitrina. Der Habichtsflügel. Gmel. Stromb. costatus. sp. 32. Mart. 3. t. 81. f. 829. 2 St."
"ACCIPITER. 24. 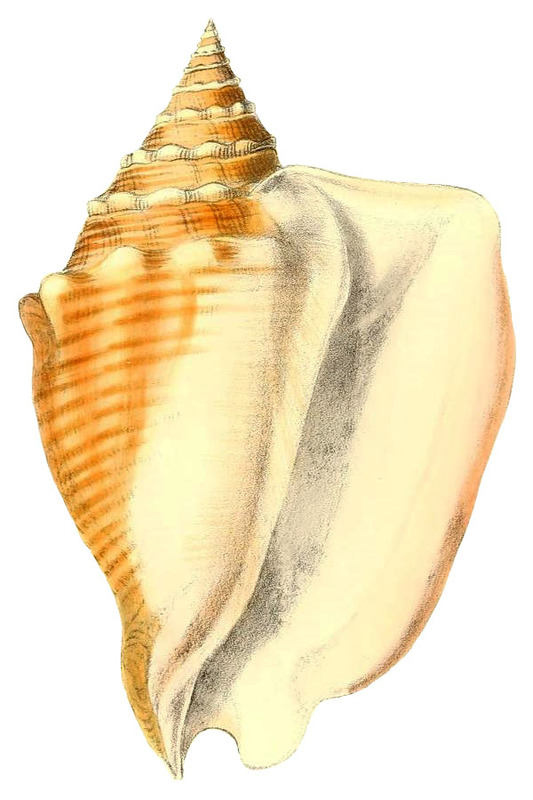 Shell with body-whirl crowned with spinous tubercles, and their interstices striated; first whirl of the spire ribbed, and the next striated transversely." "Inhabits the Asiatic Ocean. Martini." 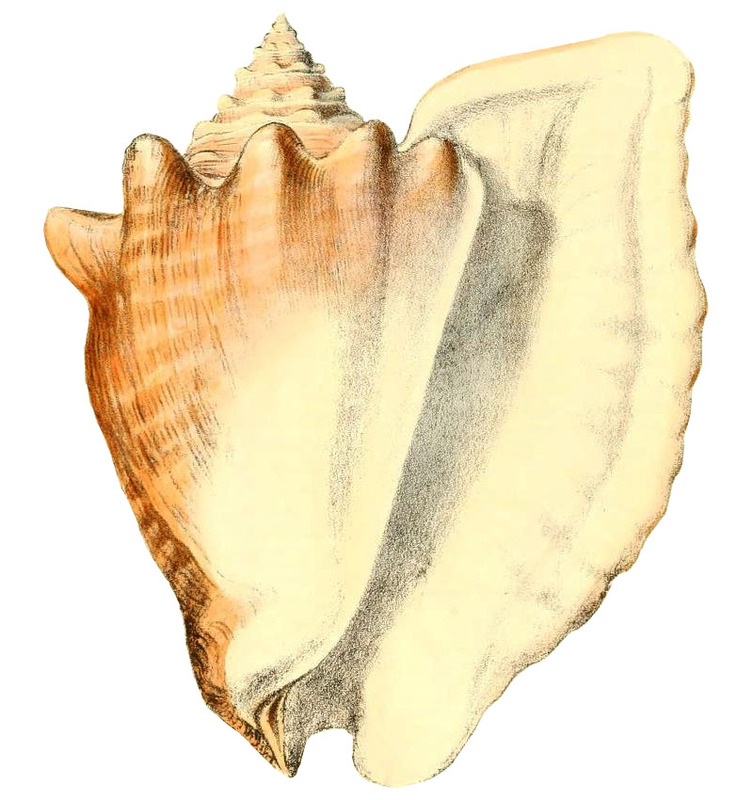 "Shell about five inches and a half long, and five inches broad, and is very nearly allied to S. Gigas. D'Avila, in his Cat. Syst. p. 185. No. 325, says. "Elle en diffère d'àilleurs en ce que la bouche n'en est point couleur de Rose, que les tubercules du premier orbe en sont plus gros à proportion, et que ceux des autres orbes sont presque entièrement cachés sous les extrémités des orbes précédens; l'aile est fort épaisse dans l'une, et papyracée dans l'autre." Gmelin's name of costatus had been before used by Da Costa for a different species." Strombus costatus. Gmelin, p. 3520. Schreibers Conch. i. p. 188. Strombus, No. 2. Schroeter Einl. i. p. 450. Ala accipitrina. Martini, iii. p. 121. t. 81. f. 829. Lister Conch. t. 863. f. 18 b. Favanne, t. 20. f. C2. ? Junior. With the outer lip unexpanded. Martini, iii. t. 91. f. 887. "Testâ nodulosâ, transversè sulcatâ: labio exteriore dilatato rotundato anticè integro: lobo basali tantum non obsoleto: aperturâ laevi albâ." 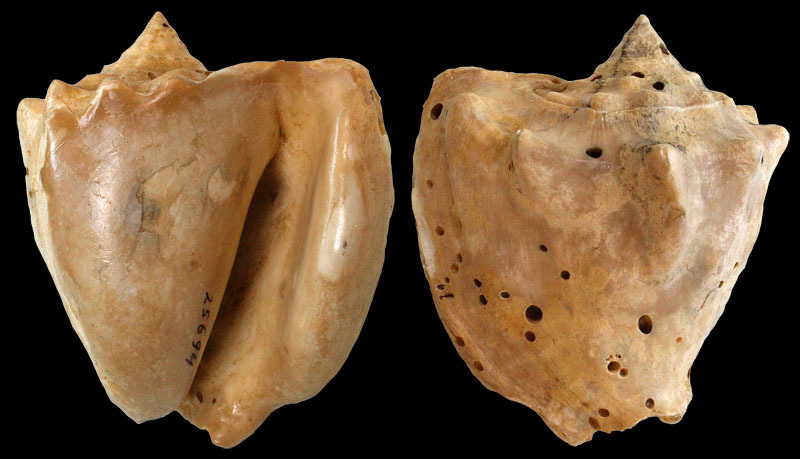 "Shell unarmed or slightly nodulous, transversely grooved; outer lip dilated, rounded, and above entire; basal lobe nearly obsolete; aperture smooth, white." 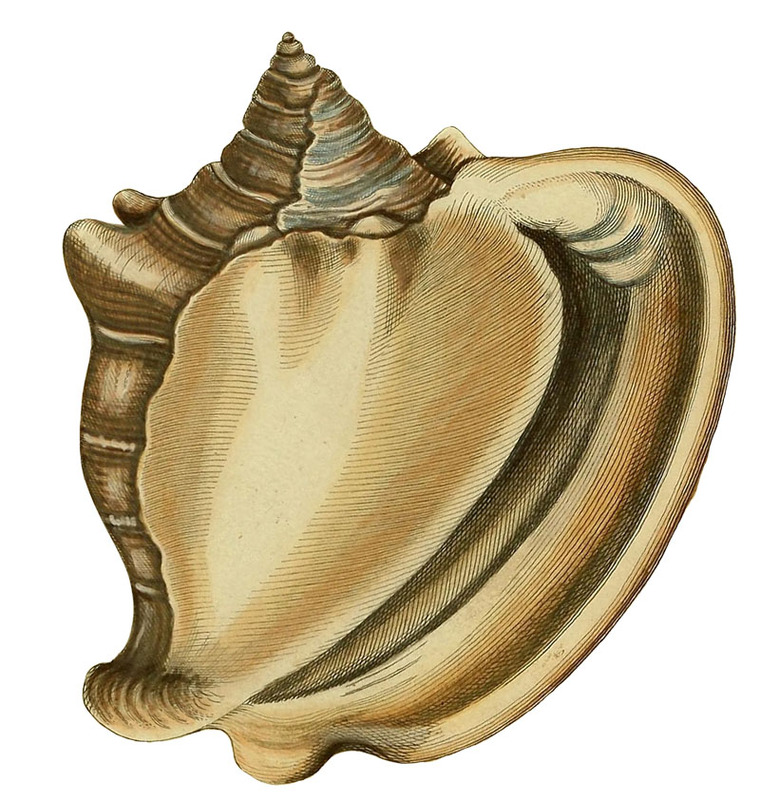 Swainson, 1841 cites "Lister 8561"
"S. testa nodosa; labii exterioris subinflexi, supra oblique rotundati, integri, ad spiram annexi, margine externo recto; aperture laevi, alba." 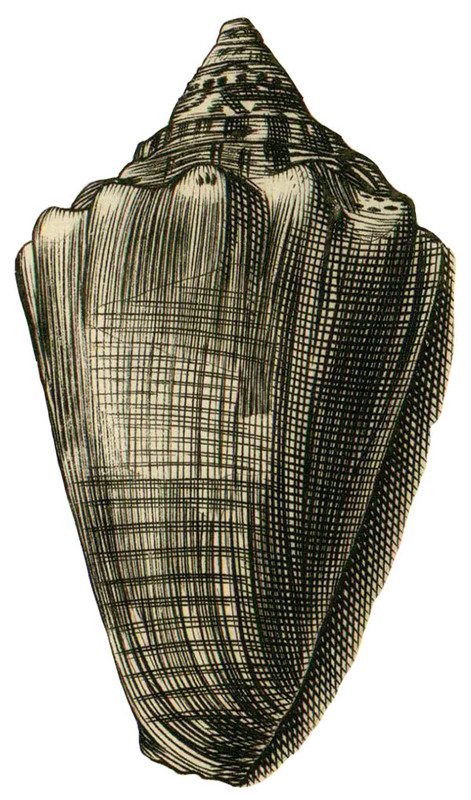 "Shell nodulous; outer lip sub-inflexed, above obliquely rounded, entire, attached to the spire, with the exterior margin straight; aperture smooth, white." "Resembling in habit S. Accipiter, but is smaller, and the spire more lengthened. The exterior margin of the outer lip, instead of being curved outwards, is perfectly straight. 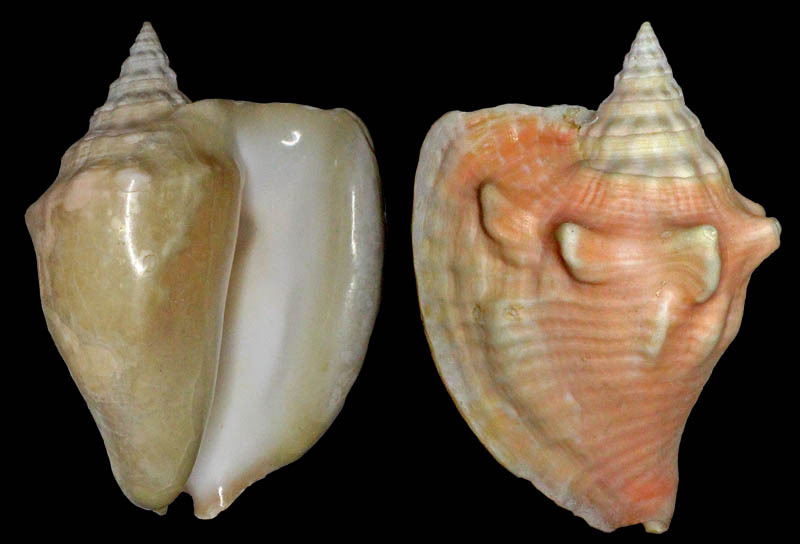 This shell has long existed in my father's collection, but my recent possession of another specimen has removed the doubts I had entertained of its being a distinct species." 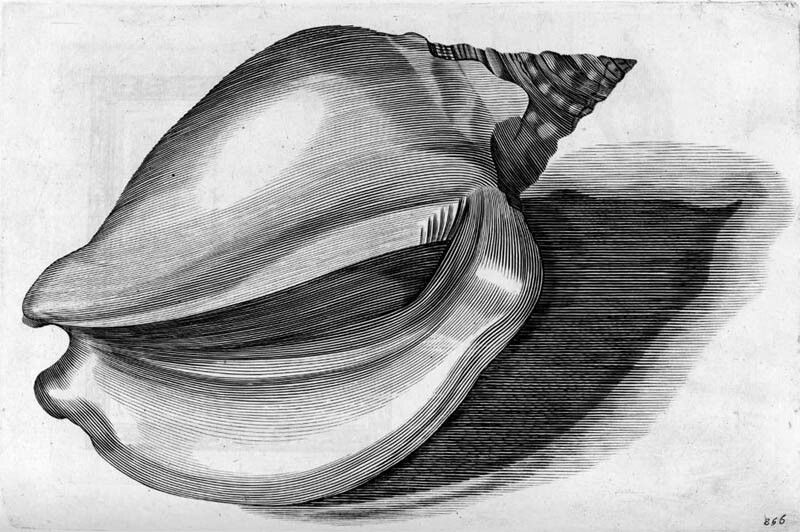 Strombus accipitrinus in Kiener, 1843, pl. ? "Both Gmelin and Lamarck refer to the same figure in Martini as the type of their species (see above). The earliest name, costatus, of Gmelin has preference over Lamarck's name accipitrinus. Swainson in his description of inermis refers to Lister's figure (Conchyliorum, 1770, fig. 856) which is unquestionably costatus with only moderately developed spines." Except for the two more prominent tubercules, jeffersonia has none of the specific characters of raninus, as the natural size photographs here shown will bear out, jeffersonia is a little larger than raninus which is 112 mm for jeffersonia and 110 mm for raninus. 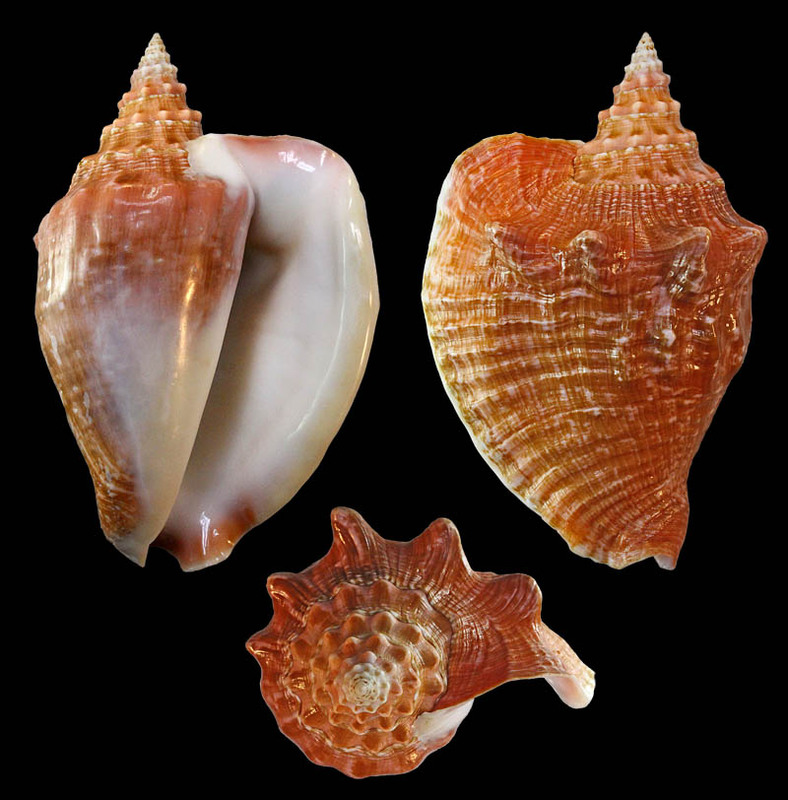 Our specimen of jeffersonia, however, do not have the protoconch and early whorl. The color alone of jeffersonia will at once distinguish it from raninus, the former pink and the latter light gray exteriors, and jeffersonia with white, and raninus with pink interiors. 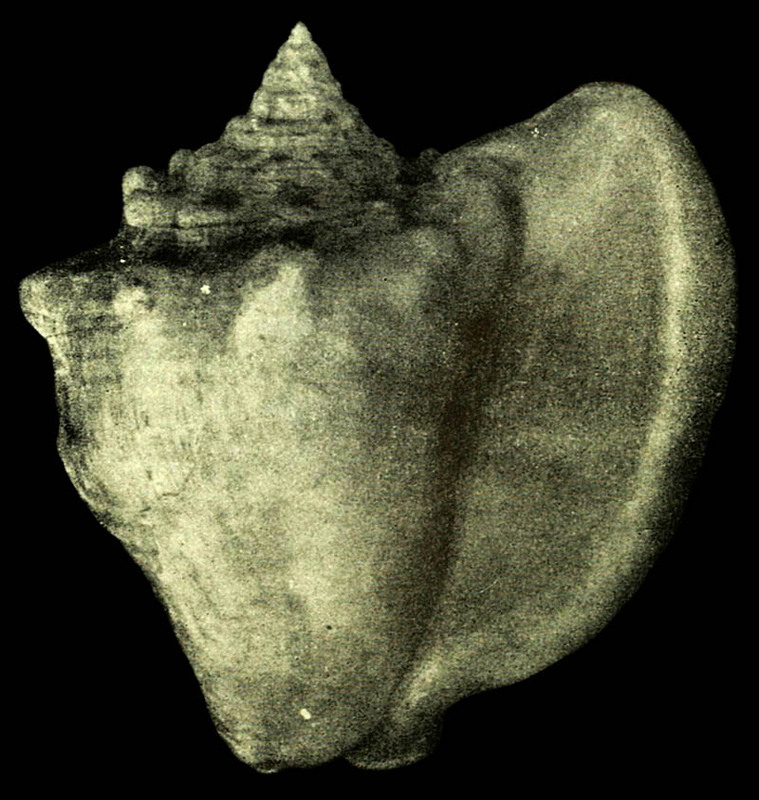 The axial sculpture of jeffersonia does not show any of the tubercular bands below the periphery that exists with raninus. The heavy folds or lamella on the upper and inside corner of raninus do not occur with jeffersonia." 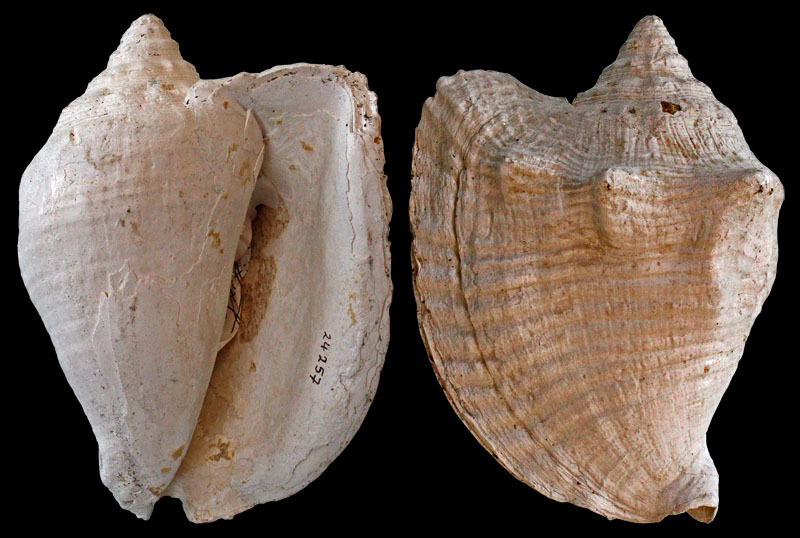 "Similar a Strombus costatus costatus Gmelin, difiriendo principalmente por la mayor cantidad de las espinas nodulosas, que en la última vuelta presenta un total de ocho a diez, mientras que en S. costatus costatus, se cuentan solamente de cuatro a seis. Dichas espinas nodulosas se encuentran también presentes y son muy prominentes en las demás vueltas de espira en costatus aguayoi, mientras que en costatus costatus, se presentan las últimas vueltas de espira entre sutura y sutura con fuertes costillas próximas a la sutura superior. En la última vuelta de S. costatus costatus, en su parte posterior, aparecen también fuertes corrigaciones espirales, pero en S. costatus aguayoi la escultura es casi lisa, notándose solamente unas ligeras corrugaciones espirales próximas al borde del labio." 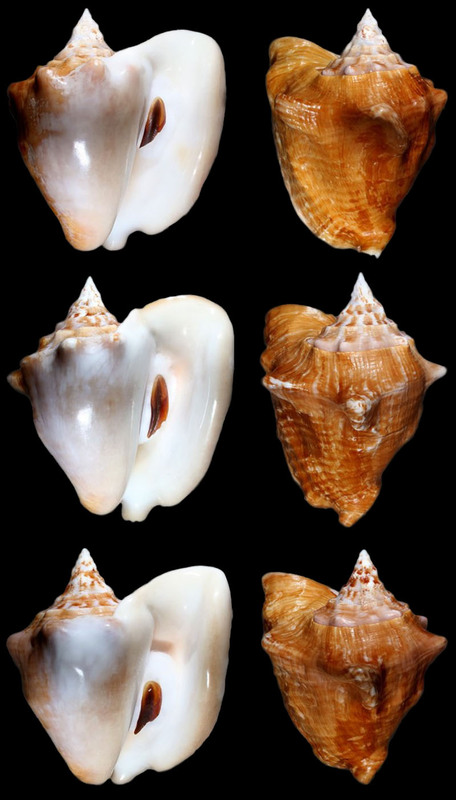 "The shells resemble Strombus costatus, but are shorter and chunkier. Whorls with from ten to twelve strong spines, which on last whorl extend completely around the shell to aperture. Sutures very distinct, each suture covering the bases of the spines on the whorl above, those of spire almost completely hidden by the upward extension of shoulders. Shoulders broad, flattened, concave. Canal bent very sharply to the right. Immature specimens have exceedingly broad, flattened spines and wide, flat shoulders. 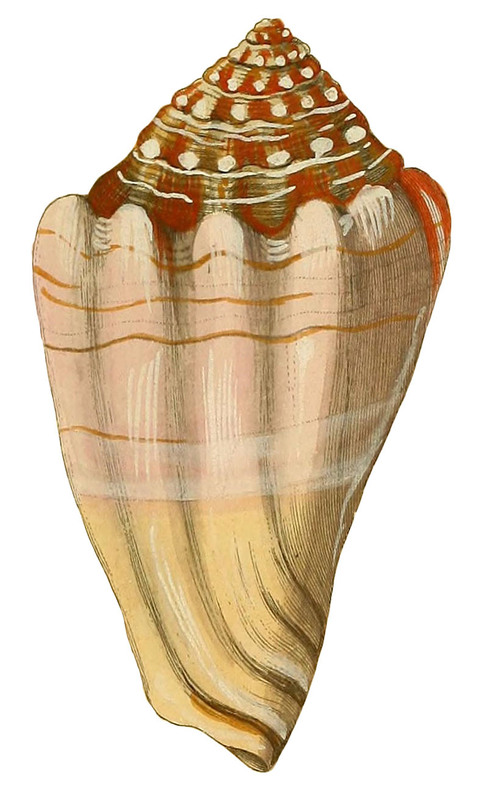 Color of adult shells whitish, longitudinally streaked with fine stripes of horn-color to brown, the spire often rose-pink with brown blotches. Columellar area and inner lip delicate rose-pink or madder, sometimes violaceous. 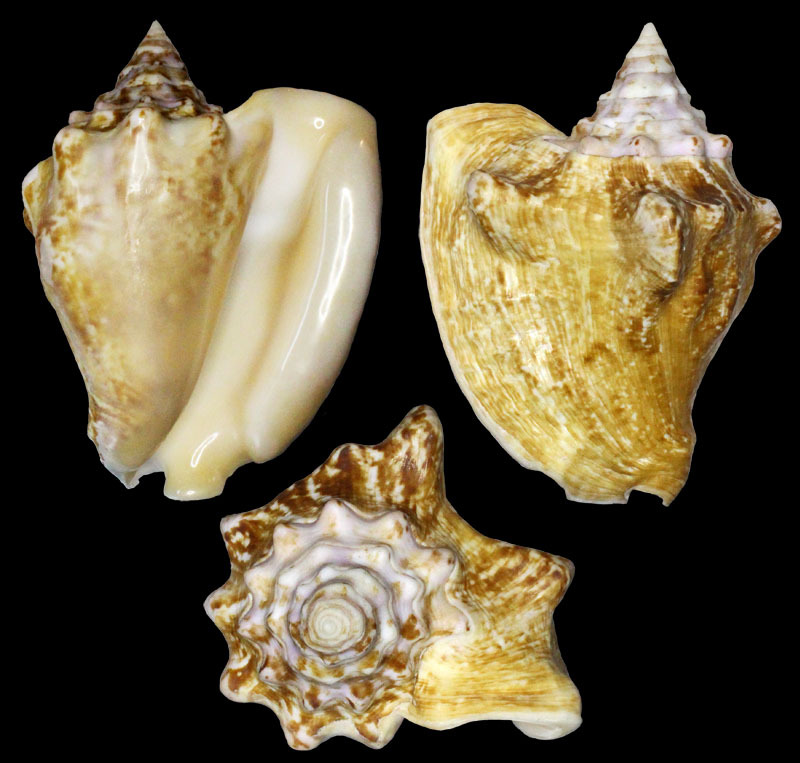 Immature shells are white heavily blotched and spotted with rich reddish-chestnut. Interior of lip lilac. Size of adult: length 6 inches, diameter 5I/2 inches. Collected in fish traps at from 30 to 40 fathoms off Dominica, B. W. I. Type in the author's collection." 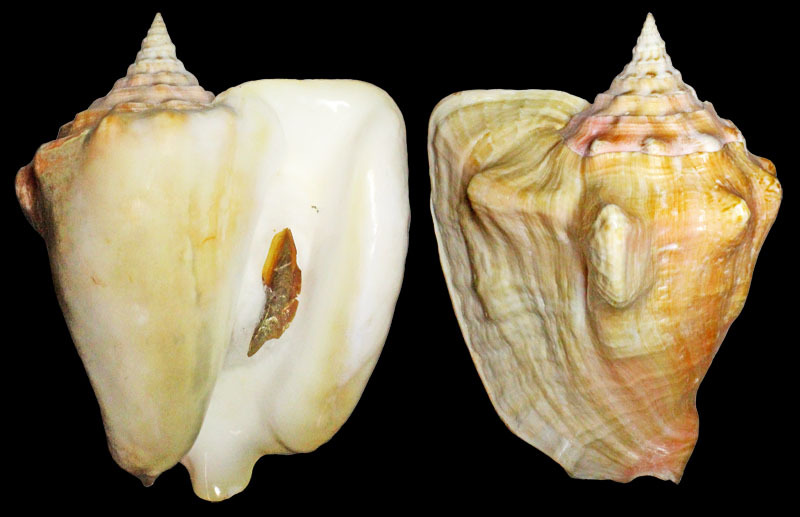 "Harbour conch, S. costatus, breed within the inshore basins of Bermuda, and their planktonic larvae may undergo development, settlement, and metamorphosis all within the basins or nearshore waters." "Banco Chinchorro is an important source of S. costatus veligers and sustains an adult and juvenile population within the reef lagoon." "At Banco Chinchorro, egg masses of S. costatus were first observed in March and were found until December when bottom water temperature decreased to 26.3°C. In Banco Chinchorro, the reproductive season of S. costatus is during a ten-month period, with a peak in copulation and egg laying in May. This period is longer than in Trinidad and Tobago where mating occurs from November until June (Perchard 1968) and longer than in Venezuela, where reproduction occurs from November to May (Brownell 1977)." Comment Anton Oleinik: "The picture with two strombus is taken off Marathon, Florida keys, off Delta Shoal near the Delta D barge wreck at 25 feet during night. Water temperature 81oF. It appered to me at first that these strombuses (Strombus (Lobatus) costatus) were mating. But at the closer look you can see that that smaller conch is attached to the back surface of the shell of the larger one. It is my understanding that the smaller one was eating the algae off the shell of the larger one and did not want to give up the salad bar." 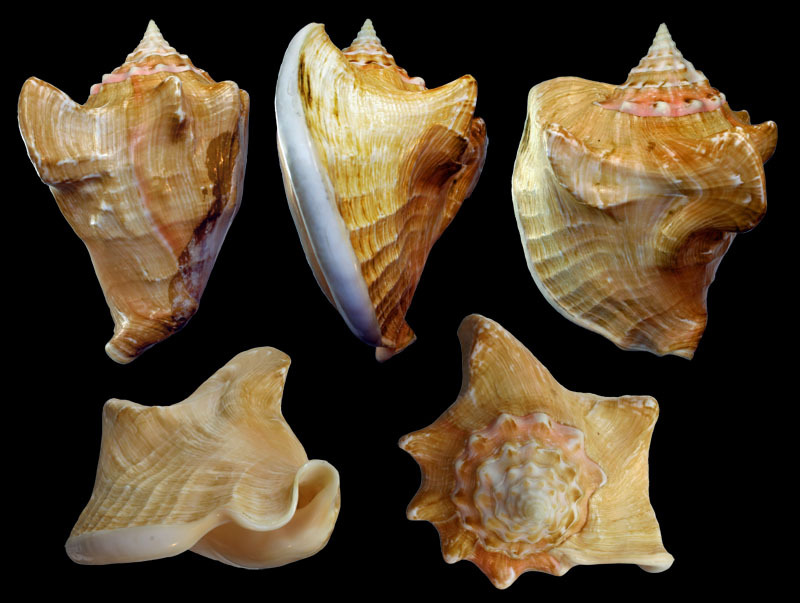 Comment Anton Oleinik: "All pictures are of Strombus (Lobatus?) costatus were taken in August - early September of 2010 off Marathon, Florida Keys, Florida, USA, in the vicinity of the Sombrero Reef. These pictures are taken in ~ 25 - 40 feet of water during the day and night on carbonate coral debris sand within the general area of the Hawk Channel and seagrass beds landward from the reef tract." Aldana Aranda, D. (1988). 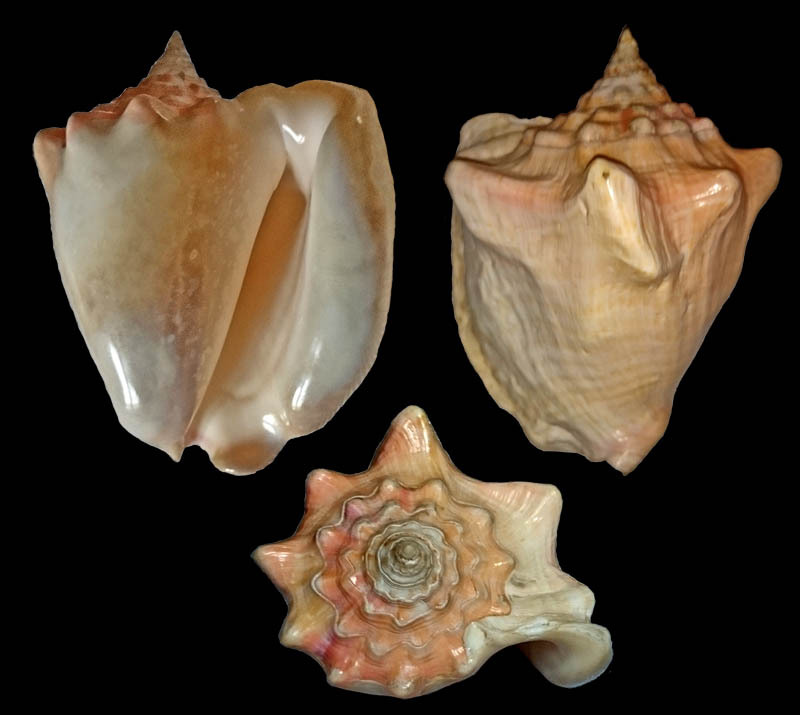 Prespectivas para la acuicultura del Caracol Strombus costatus en el Golfo de Mexico y en el Caribe. In Congreso Iberoamericano y del Caribe. Punta de Piedras, Nueva Esparta (Venezuela). 8-15 May 1988..
Aldana Aranda, D., & Torrentera, L., A. Lucas, T. Brulé, E. Salguero and F. Rendón. 1989. 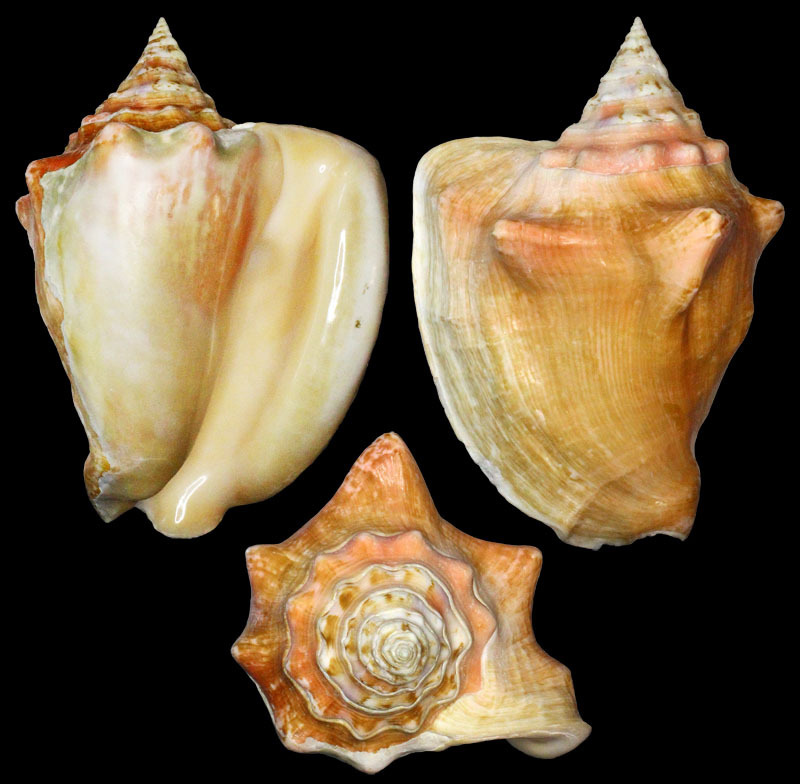 Effects of temperature, algal food, feeding rate and density on the larval growth of the milk conch (Strombus costatus) in México. Aquaculture, 76, 361-371. Aldana Aranda, D., Lucas, A., Brulé, T., Andrade, M., Garcia, E., Maginot, N., & Le Pennec, M. (1991). Observations on ingestion and digestion of unicellular algae by< i> Strombus gigas</i> larvae (Mollusca, Gastropoda) using epifluorescence microscopy. Aquaculture, 92, 359-366. Aldana-Aranda, D., & Patiño Suárez, V. (1998). 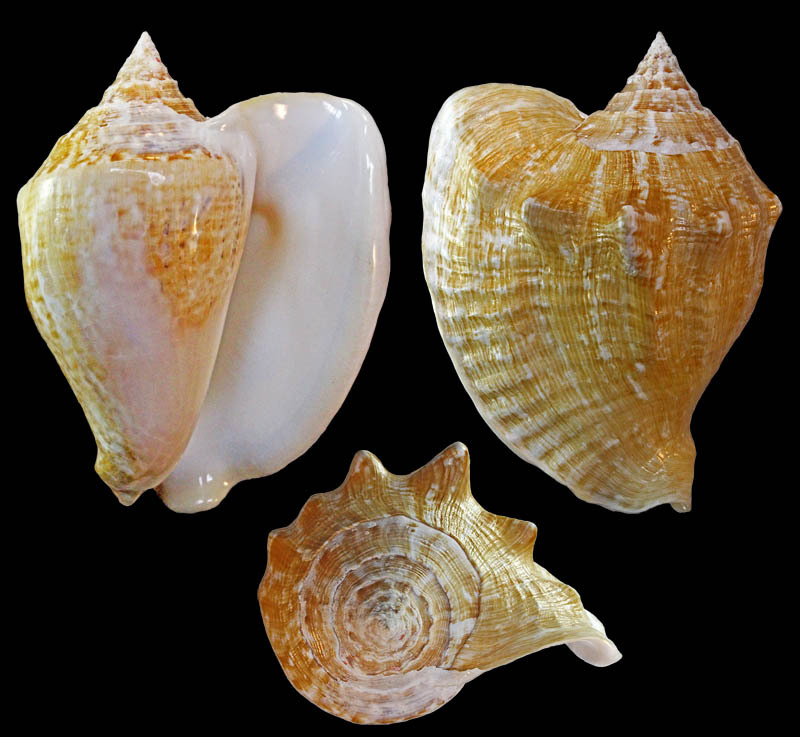 Overview of diets used in larviculture of three Caribbean Conchs: Queen Conch Strombus gigas, Milk Conch Strombus costatus and Fighting Conch Strombus pugilis. Aquaculture, 167(3), 163-178. Appeldoorn, R. S. (1984). 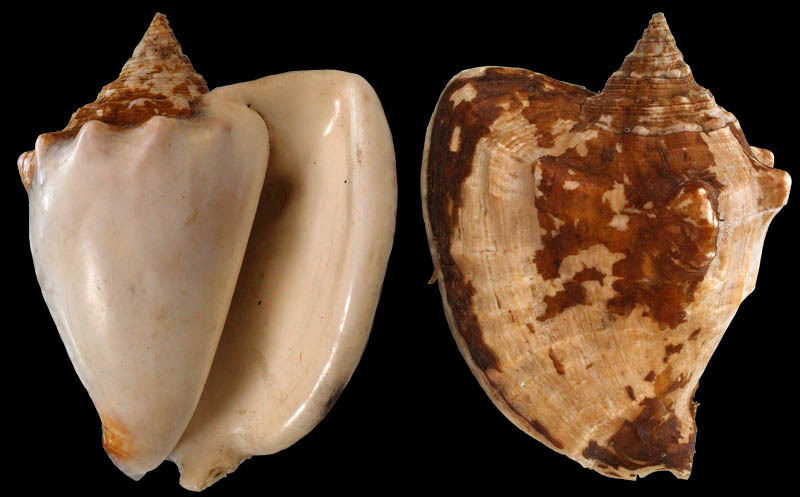 The effect of size on mortality of small juvenile conchs (Strombus gigas L. and S. costatus G.). J. Shellfish. Res, 4, 37-43. Appeldoorn, R. S. (1985). Growth, mortality and dispersion of juvenile, laboratory-reared conchs, Strombus gigas and S. costatus, released at an offshore site. Bulletin of marine science, 37(3), 785-793. Appeldoorn, R. S. (1991). History and recent status of the Puerto Rican conch fishery. In Proc. Gulf Carib. Fish. Inst (Vol. 40, pp. 267-282). Appeldoorn, R. S., & Sanders, I. M. (1985). Quantification of the density-growth relationship in hatchery-reared juvenile conchs (Strombus gigas Linne and S. costatus Lime). J. Shel fish Res, 4(1), 63-66. Balán-Dzul, V., & de Jesús-Navarrete, A. (2011). 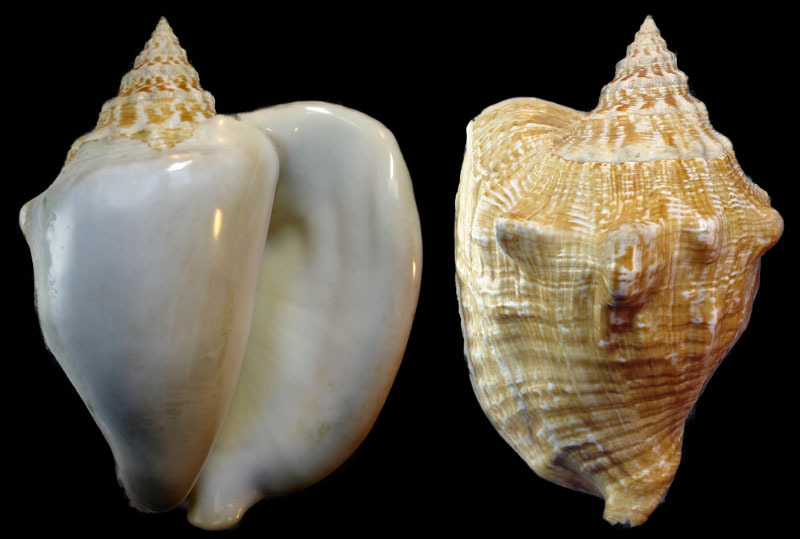 Densidad, abundancia y estructura poblacional del caracol blanco Strombus costatus en el Caribe Mexicano. Revista de biología marina y oceanografía, 46(1), 1-8. Ballantine, D. L., & Appeldoorn, R. S. (1983). Queen conch culture and future prospects in Puerto Rico. In Proc. Gulf Caribb. Fish. Inst (Vol. 35, pp. 57-63). Bandel, K. (1976). 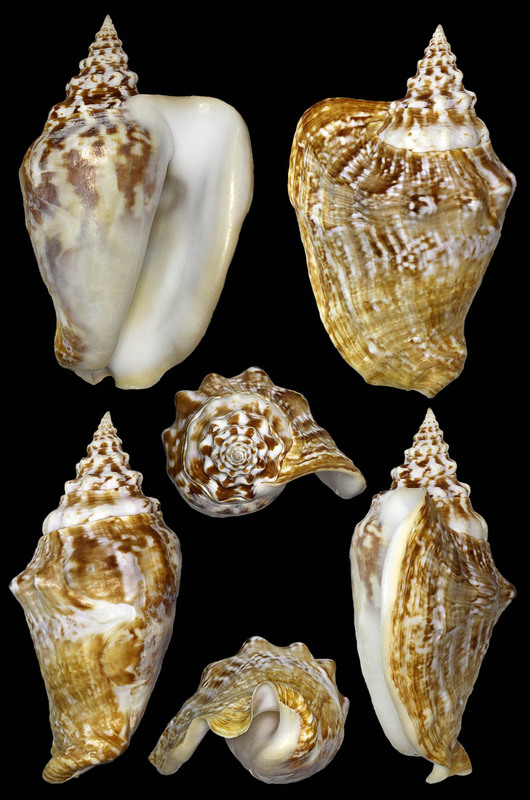 Die Gelege karibischer Vertreter aus den Uberfamilien Strombacea, Naticacea und Tonnacea (Mesogastropoda) sowie Beobachtungen im Meer und Aquarium. Berg, C. J. (1975). Behavior and ecology of conch (superfamily Strombacea) on a deep subtidal algal plain. Bulletin of Marine Science, 25(3), 307-317. Blanqueto-Cordova, D., Rodríguez-Gil, L. A., Reyes-Sosa, C. F., Alpizar-Carrillo, R., & Rivas-Ruiz, I. R. (2007). Puestas de masas de huevos de Strombus costatus (Gmelin) usando encierros en el parque nacional de Isla Convoy, Isla Mujeres, Quintana Roo. Estudios sobre la Malacología y Conquiliología en México. Ríos-Jara, E., MC, Esqueda-González y CM Galván-Villa (eds). Universidad de Guadalajara, México, 146-147. Brito Manzano, N., Aldana Aranda, D., & Baqueiro Cárdenas, E. (1999). Development, growth and survival of larvae of the fighting conch Strombus pugilis L.(Mollusca, Gastropoda) in the laboratory. Bulletin of marine science, 64(2), 201-208. Brooke, S. D. (1996). 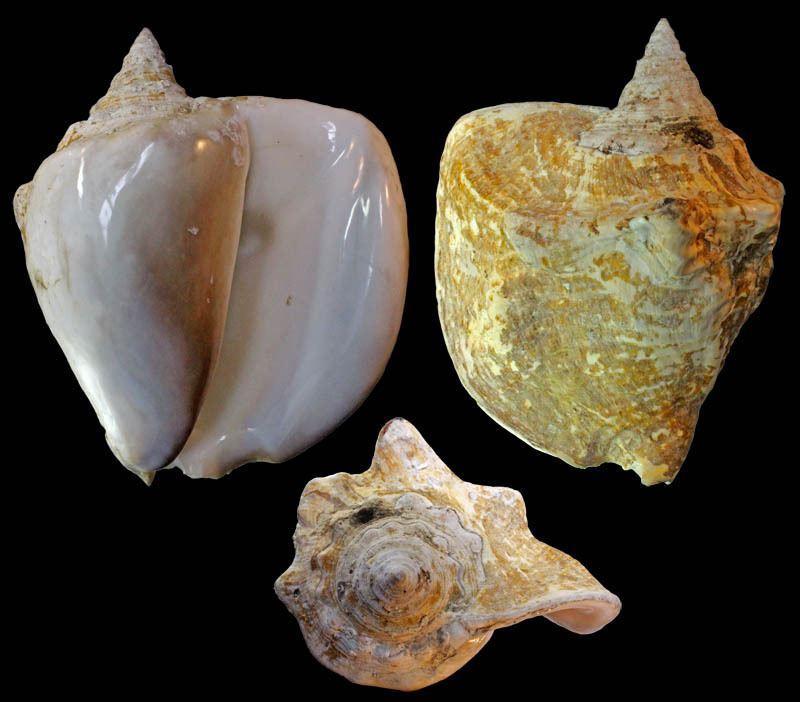 A comparison of natural and laboratory diets for the culture of marine invertebrate larvae: American oyster, Crassostrea virginica, queen conch, Strombus gigas, and milk conch, Strombus costatus (Doctoral dissertation, College of William and Mary.). Brownell, W. N. (1977). 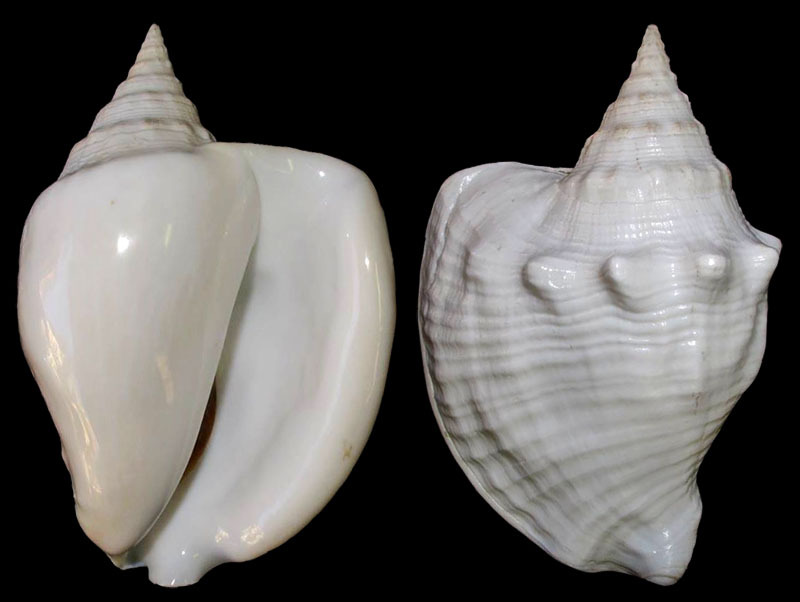 Reproduction, laboratory culture, and growth of Strombus gigas, S. costatus and S. pugilus in Los Roques, Venezuela. Bulletin of Marine Science, 27(4), 668-680. Currey, J. D., & Taylor, J. D. (1974). The mechanical behaviour of some molluscan hard tissues. Journal of Zoology, 173(3), 395-406. D'ANTONIO, H. M. (2011). MOLLUSKS OF THE LATE PLEISTOCENE OOLITIC FACIES OF THE MIAMI LIMESTONE. In Geological Society of America Abstracts with Programs, (Vol. 43, No. 2, p. 88). Davis, M., Bolton, C. A., & Stoner, A. W. (1993). 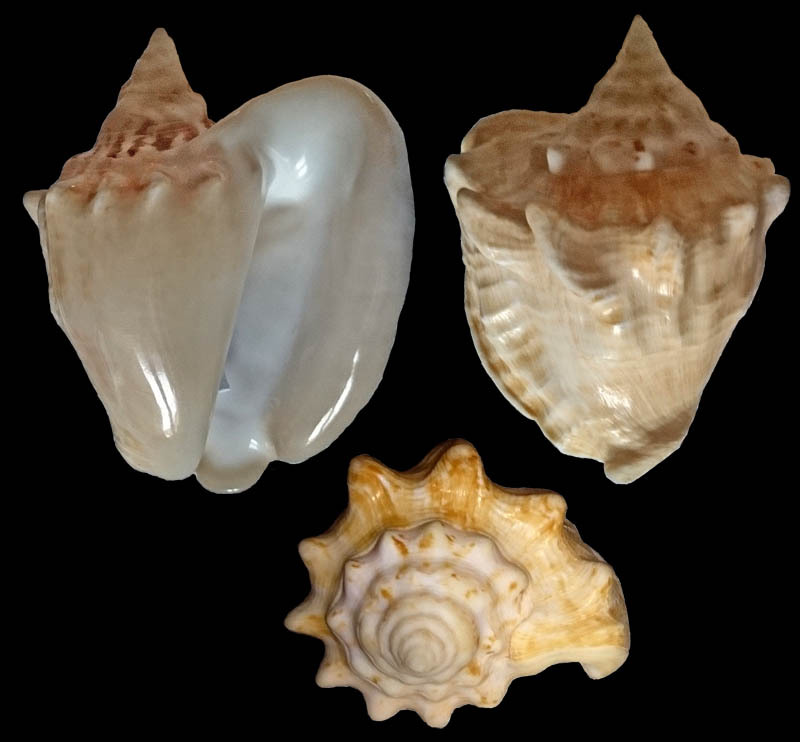 A comparison of larval development, growth, and shell morphology in three carribean Strombus species. The veliger, 36(3), 236-244. Domaneschi, O. (1986). 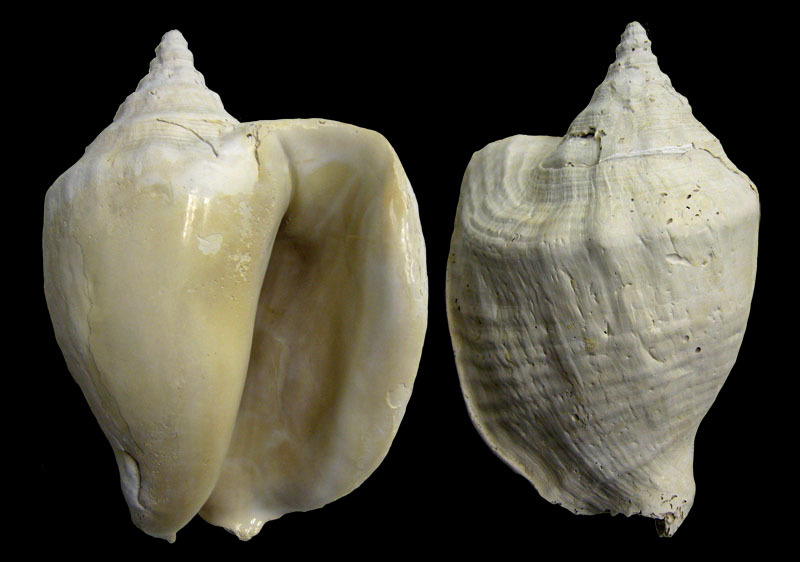 Reencontro de Strombus costatus Gmelin, 1791 (Gastropoda, Strombidae) no litoral do Estado de São Paulo, Brasil. Bolm Zool, 10. Eaton, J. D. (1974). 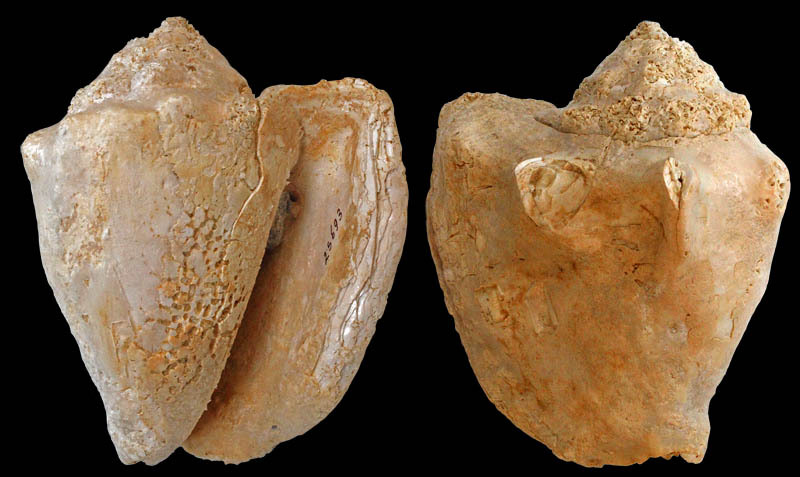 Shell celts from coastal Yucatan, Mexico. Bulletin of the Texas Archaeological Society, 45, 197-208. Epstein, S., & Lowenstam, H. A. (1953). Temperature-shell-growth relations of recent and interglacial Pleistocene shoal-water biota from Bermuda. The Journal of Geology, 424-438. Fausto Filho, J., Matthews, H. R., & Lima, H. D. H. (1966). Nota preliminar sobre a fauna dos bancos de lagostas no Ceará. Grana-Raffucci, F. A., & Appeldoorn, R. S. (1997). Age determination of larval strombid gastropods by means of growth increment counts in statoliths. Fishery Bulletin, 95(4), 857-862. Hernández-Delgado, E. A., Lucking, M. A., Márquez, J., García, K., Martínez-Rubio, C., Martinó, D., ... & Acosta, E. (2002). STATUS OF THE SHALLOW-WATER SEAGRASS COMMUNITIES AND CONCH POPULATIONS WITHIN THE LUIS PEÑA CHANNEL NO-TAKE NATURAL RESERVE, CULEBRA ISLAND, PUERTO RICO. Methods, 5, 14. Hoskins, C. W. (1964). Molluscan biofacies in calcareous sediments, Gulf of Batabano, Cuba. AAPG Bulletin, 48(10), 1680-1704. M.L. Jaume & A. del Valle, 1947. 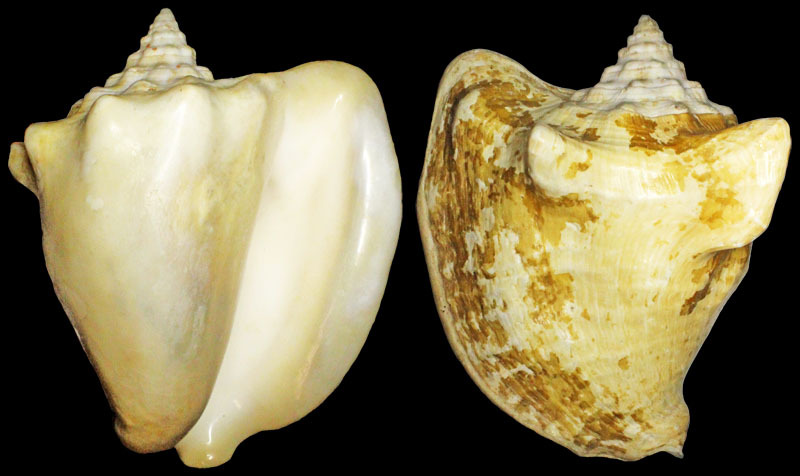 Nueva Subspecie de Strombus en Cuba; Revista de la Sociedad Malacológica "Carlos de la Torre. ", Vol. 5(1), p. 9-10. Kaufmann, R., & Götting, K. J. (1970). Prosobranchia aus dem Litoral der karibischen Küste Kolumbiens. Helgoländer wissenschaftliche Meeresuntersuchungen, 21(3), 333-398. Massemin, D., Lamy, D., Pointier, J. P. & Gargominy, O. 2009. Coquillages et escargots de Guyane. Biotope, Collection Parthénope, Mèze. 456 pp. Matthews, H. R. (1967). Notas sobre os Estrombídeos do Nordeste Brasileiro. McClanahan, T. (2002). A comparison of the ecology of shallow subtidal gastropods between western Indian Ocean and Caribbean coral reefs. Coral Reefs, 21(4), 399-406. Moore, H. B., & Moore, D. M. (1946). Preglacial history of Bermuda. Geological Society of America Bulletin, 57(2), 207-222. Percharde, P. L. (1968). 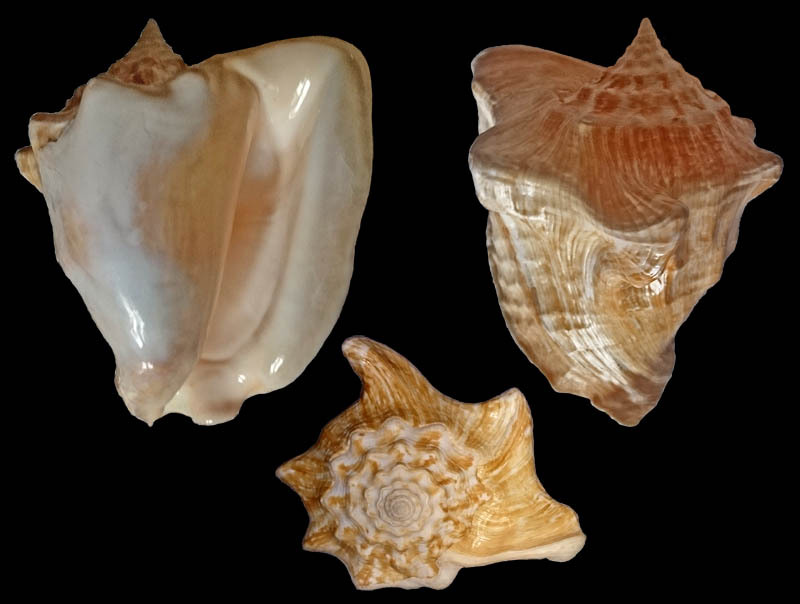 Notes on distribution and underwater observations on the molluscan genus Strombus as found in the waters of Trinidad and Tobago. Carib. J. Sci, 8(1-2), 47-55. Percharde, P. L. (1982). 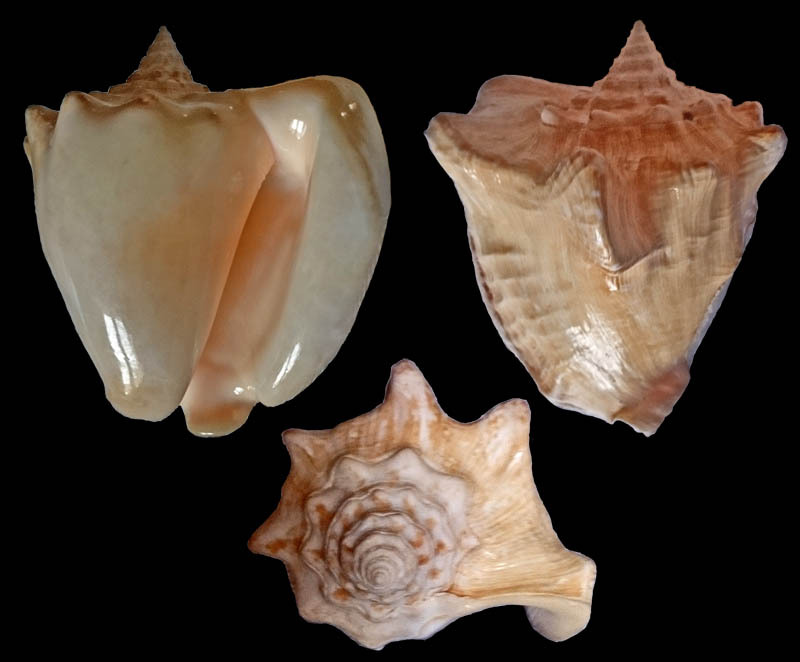 A Comparison of the Strombus (Mollusca) Colonies, of two Southern Caribbean Islands: Trinidad and Grenada. Carib. J. Sci, 18(1-4), 35-39. Pérez Pérez, M., & Aldana Aranda, D. (2000). 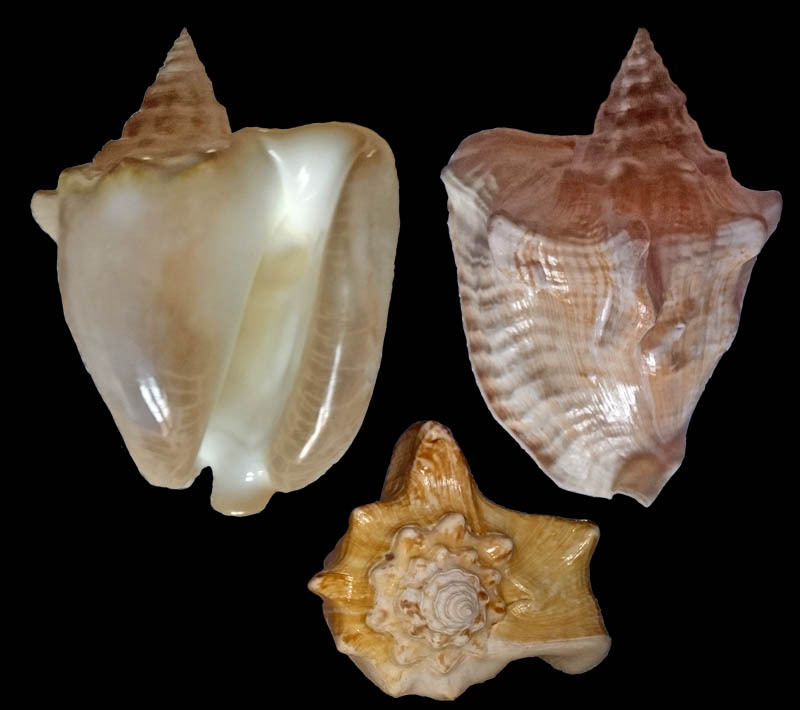 Distribución, abundancia y morfometría de Strombus costatus, Turbinella angulata, Busycon contrarium y Pleuroploca gigantea (Mesogasteropoda: Strombidae, Turbinellidae, Neptuneidae y Fasciolaridae) en Yucatán, México. Revista de Biología Tropical, 48(1), 145-152. Peterman, Z. E., Hedge, C. E., & Tourtelot, H. A. (1970). Isotopic composition of strontium in sea water throughout Phanerozoic time. Geochimica et Cosmochimica Acta, 34(1), 105-120. Petuch, E. J. (1972). 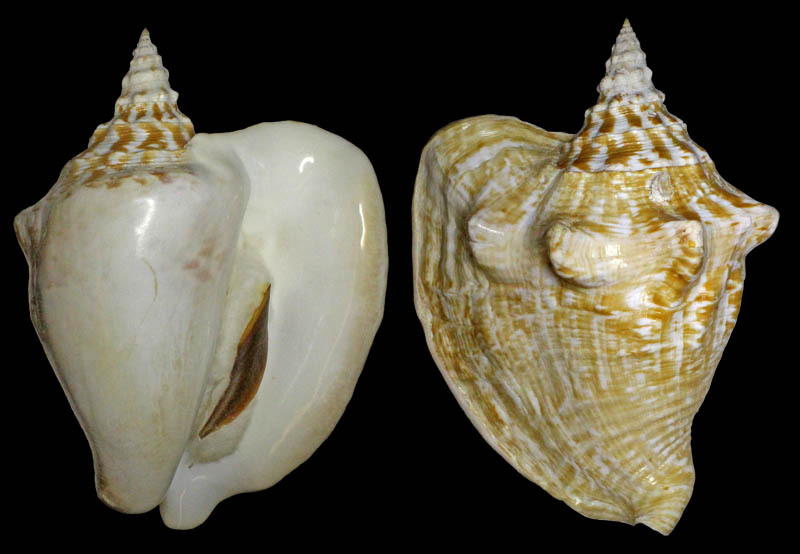 Morum dennisoni Reeve (Gastropoda: Cassidae) and Strombus costatus Gmelin (Gastropoda: Strombidae) collected off the North Carolina coast. Veliger, 15, 51-52. Questel, K. & Le Quellec, F. 2012. La faune terrestre et aquatique de Saint-Barthélemy (Antilles françaises). Synthèse bibliographique et quelques données inédites. Version 1.2. La Réserve Naturelle de Saint-Barthélemy, Alsophis et Université des Antilles et de la Guyane. 65 pp. Robertson, R. (1959). 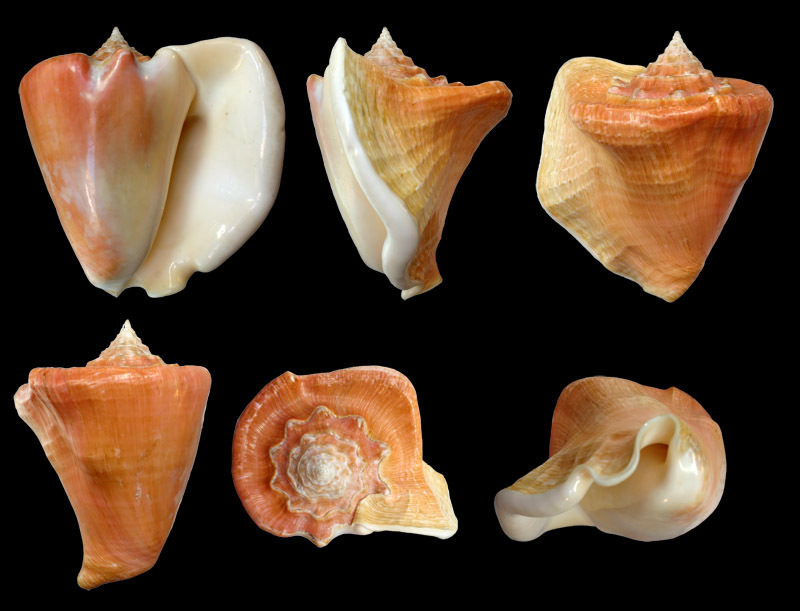 Observations on the spawn and veligers of conchs (Strombus) in the Bahamas. 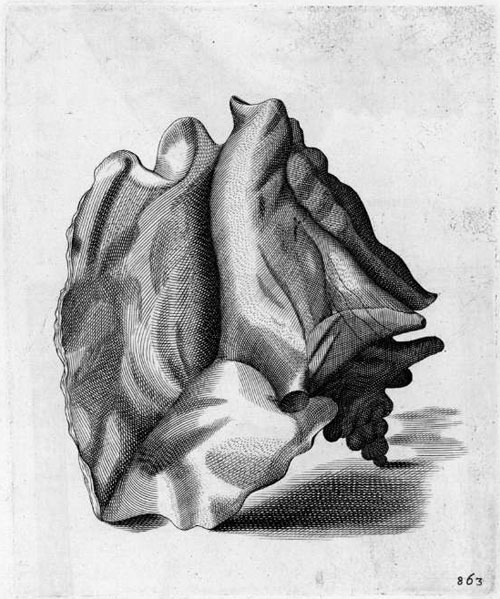 Journal of Molluscan Studies, 33(4), 164-171. Rodríguez, G. A. (1995). Eclosión del caracol de leche, Strombus costatus basado sobre el desarrollo embrionario. Rev. del Centro de Graduados e Invest. ITM, 23, 1-18. Rodriguez Gil, L. A. (1995). 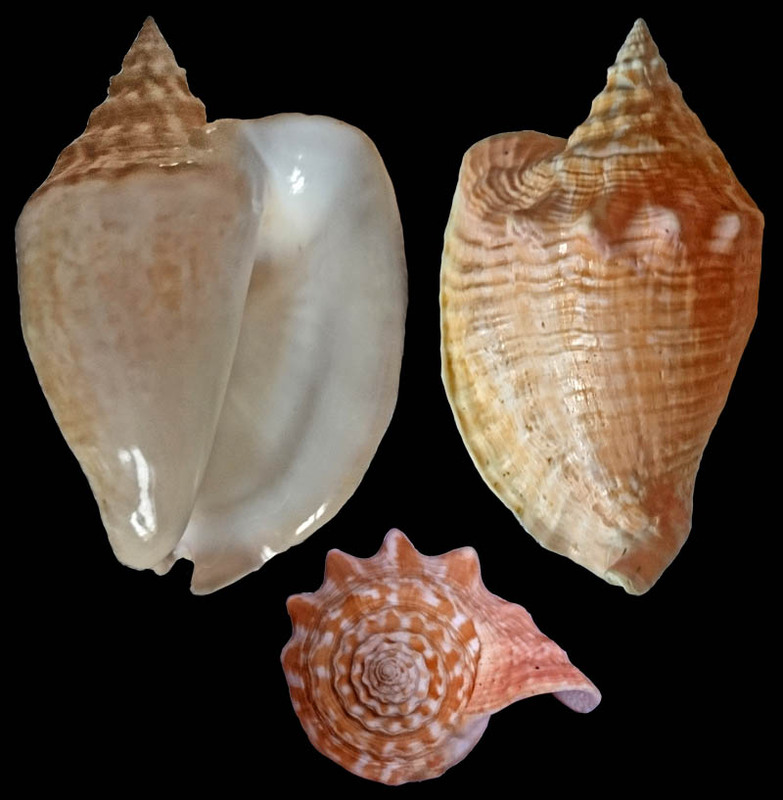 Biochemical composition of larval diets and larvae, temperature, and induction of metamorphosis related to the early life history of the milk conch, Strombus costatus Gmelin (Doctoral dissertation, University of Puerto Rico, Mayaguez Campus). Rodriguez Gil, L. A. (1996). 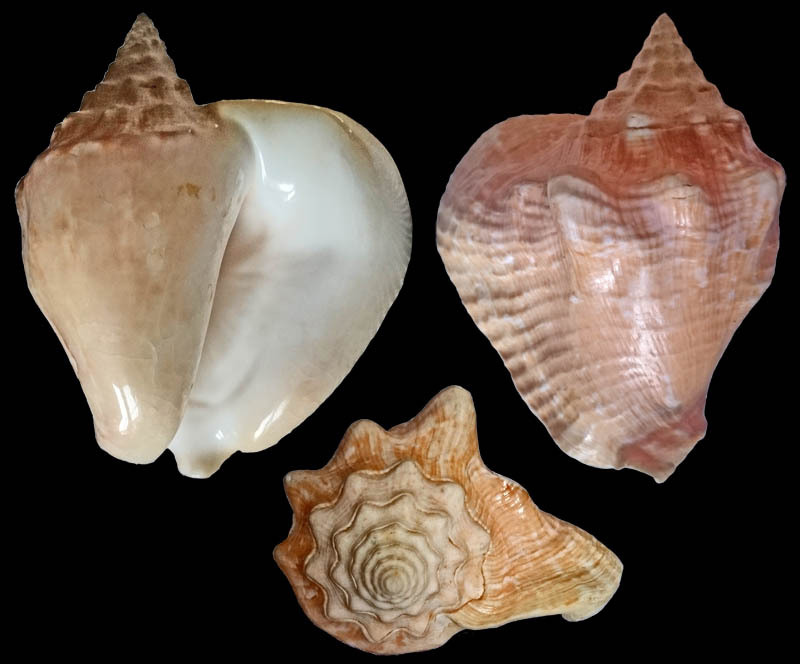 Development of intensive larval culture for the milk conch, Strombus costatus Gmelin in the Yucatan Peninsula. In Proc. Gulf Carib. Fish. Inst (Vol. 44, pp. 514-532). 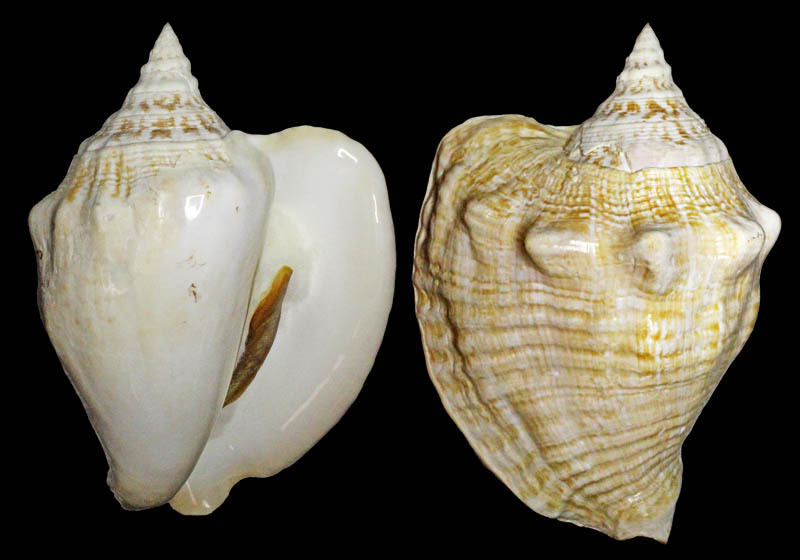 RODRÍGUEZ-GIL, L. A. Parámetros de Crecimiento, Mortalidad y el Estado de la Pesquería Basados en la Distribución de los Grosores de Labio de una Población Adulta de Caracol Blanco Strombus costatus Gmelim en la Costa de Yucatán, México Growth, Mortality and Status of the Fishery in an Adult. Schröter, J. S. 1779. Die Geschichte des Flussconchylien, mit vorzüglicher Rücksicht auf die jenigen welche in dem Thüringischen Wassern leben. vi + 434 pp, pls 1–11. Halle. Shawl, A. L., & Davis, M. (2004). 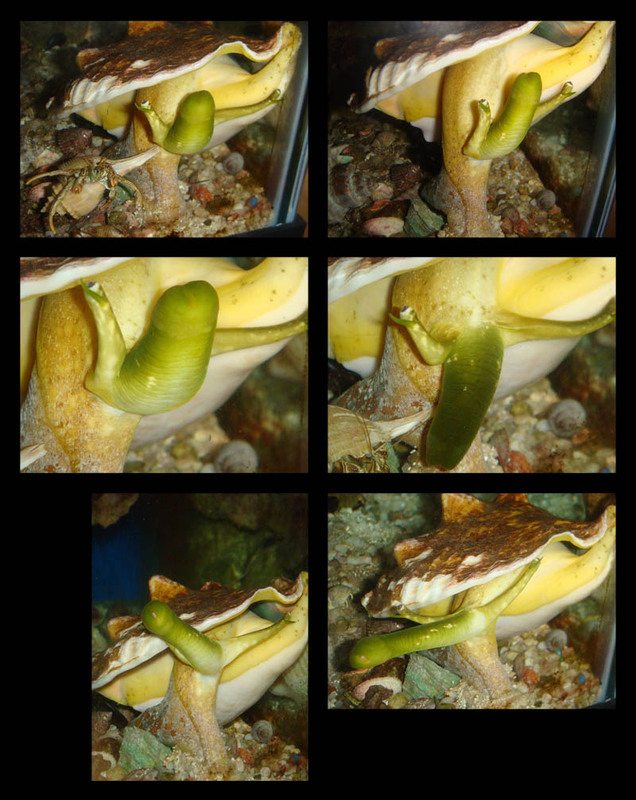 Captive breeding behavior of four Strombidae conch. Journal of Shellfish Research, 23(1), 157-164. Stoner, A. W. (1989). Density-dependent growth and grazing effects of juvenile queen conch Strombus gigas L. in a tropical seagrass meadow. Journal of Experimental Marine Biology and Ecology, 130(2), 119-133. Stoner, A. W., Mehta, N., & Lee, T. N. (1997). Recruitment of Strombus veligers to the Florida Keys reef tract: relation to hydrographic events. Oceanographic Literature Review, 44(11). Stoner, A. W., & Ray-Culp, M. (2000). Evidence for Allee effects in an over-harvested marine gastropod: density-dependent mating and egg production. Marine Ecology Progress Series, 202, 297-302. Stoner, A. W., & Schwarte, K. C. (1996). 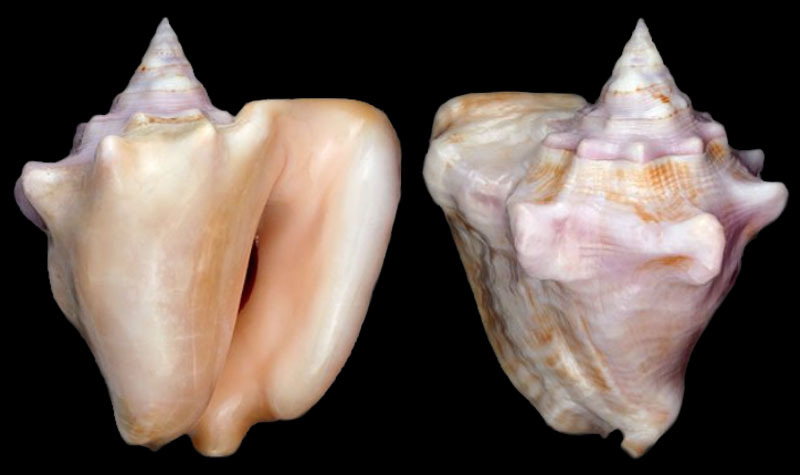 Source and significance of deep-water conch in the central Bahamas. In Proceedings of the Gulf and Caribbean Fisheries Institute (Vol. 44, pp. 459-463). Gulf and Caribbean Fisheries Institute. Stoner, A. W., & Smith, N. P. (1998). Across-shelf transport of gastropod larvae in the central Bahamas: rapid responses to local wind conditions. Journal of plankton research, 20(1), 1-16. Telford, M., & Daxboeck, C. (1978). Porcellana sayana Leach (Crustacea: Anomura) symbiotic with Strombus gigas (Linnaeus)(Gastropoda: Strombidae) and with three species of hermit crabs (Anomura: Diogenidae) in Barbados. Bulletin of Marine Science, 28(1), 202-205. Tewfik, A., Guzmán, H. M., & Jácome, G. (1998). 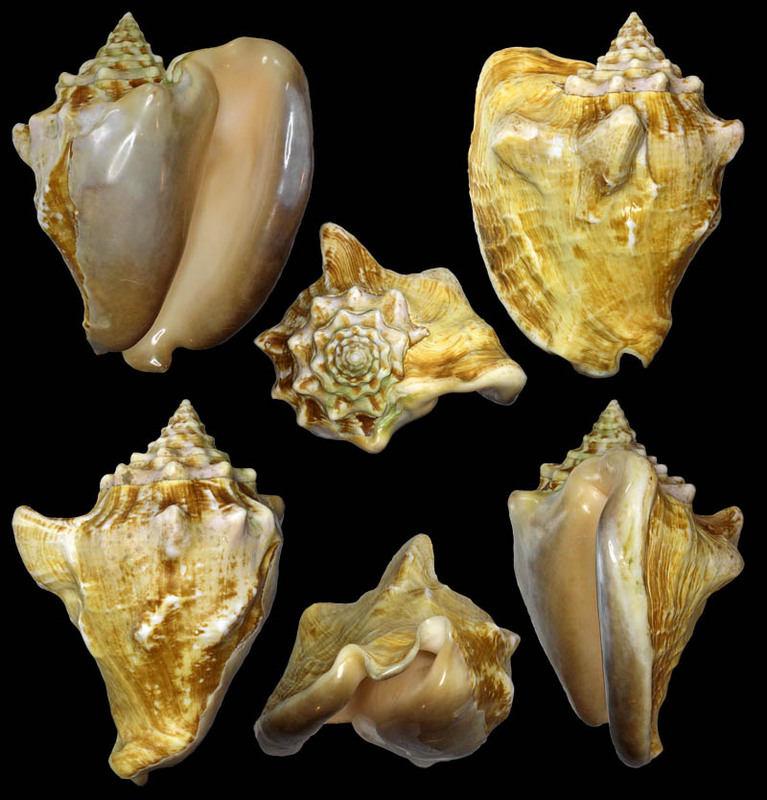 Assessment of the queen conch Strombus gigas (Gastropoda: Strombidae) population in Cayos Cochinos, Honduras. Rev. Biol. Trop, 46(Suppl 4), 137ą150. Tewfik, A., & Guzman, H. M. (2003). Shallow-water distribution and population characteristics of Strombus gigas and S. costatus (Gastropoda: Strombidae) in Bocas del Toro, Panama. Journal of Shellfish Research, 22(3), 789-794. Torres-Rosado, Z. A. (1987). 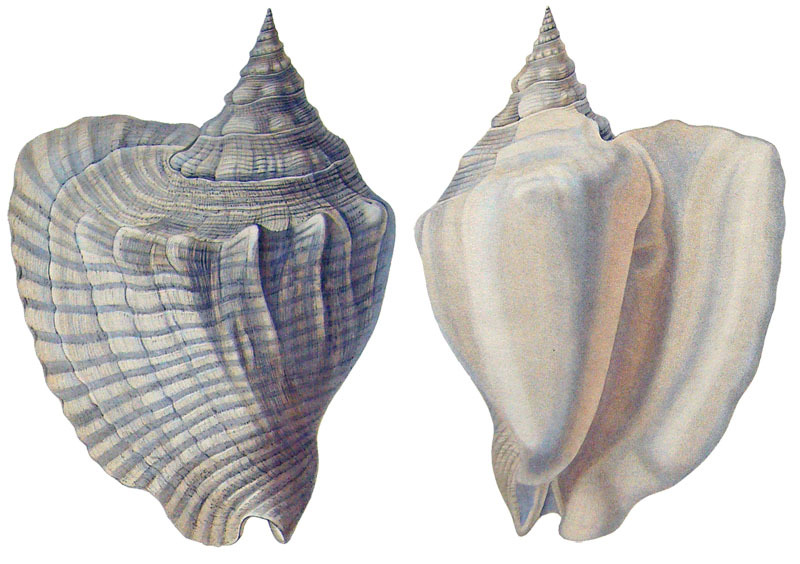 Distribution of two mesogastropods, the queen conch, Strombus gigas Linnaeus, and the milk conch, Strombus costatus Gmelin. La Parguera, Lajas, Puerto Rico. MS Thesis, Universidad de Puerto Rico, Mayaguez. van Rijn, J. 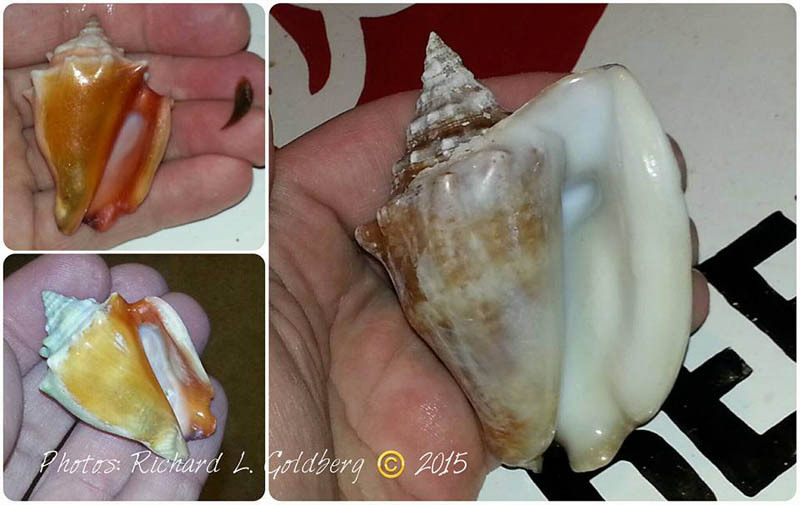 Initial Queen conch (Strombus gigas) studies on St. Eustatius. Verrill, A.H., 1950. 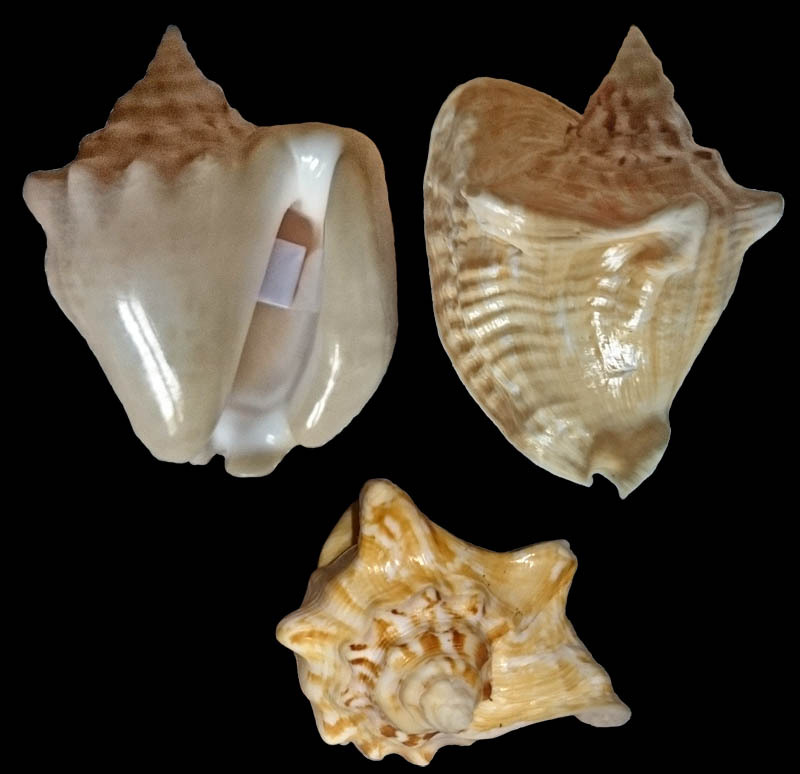 New marine mollusks from Dominica. The Nautilus 63(4): 126-128, pls 9-10. Volland, J. M., Frenkiel, L., Aranda, D. A., & Gros, O. (2010). Occurrence of Sporozoa-like microorganisms in the digestive gland of various species of Strombidae. Journal of Molluscan Studies, eyq005. Volland, J. M., Gros, O., Frenkiel, L., & Aranda, D. A. (2010). 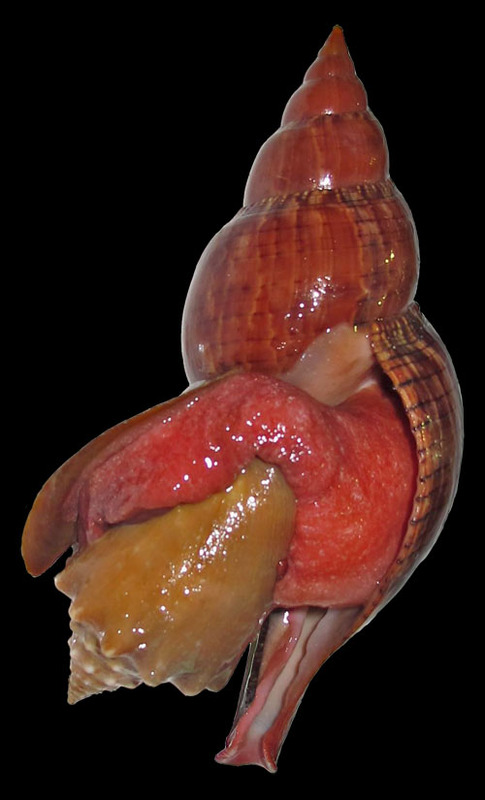 Apicomplexan parasite in the digestive gland of various species of the family strombidae: Strombus costatus, S. gigas, and S. pugilis. In Proceedings of the Gulf and Caribbean Fisheries Institute (Vol. 62, pp. 430-432). Gulf and Caribbean Fisheries Institute, c/o Harbor Branch Oceanographic Institution, Inc. Fort Pierce FL 34946 United States. Wefer, G., & Killingley, J. S. (1980). 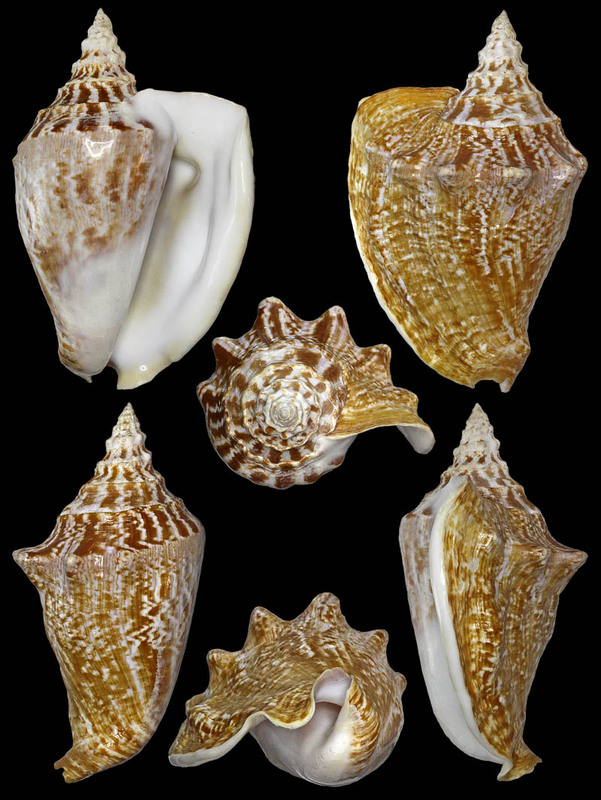 Growth histories of strombid snails from Bermuda recorded in their O-18 and C-13 profiles. Marine Biology, 60(2-3), 129-135. Welch J. J. (2010). 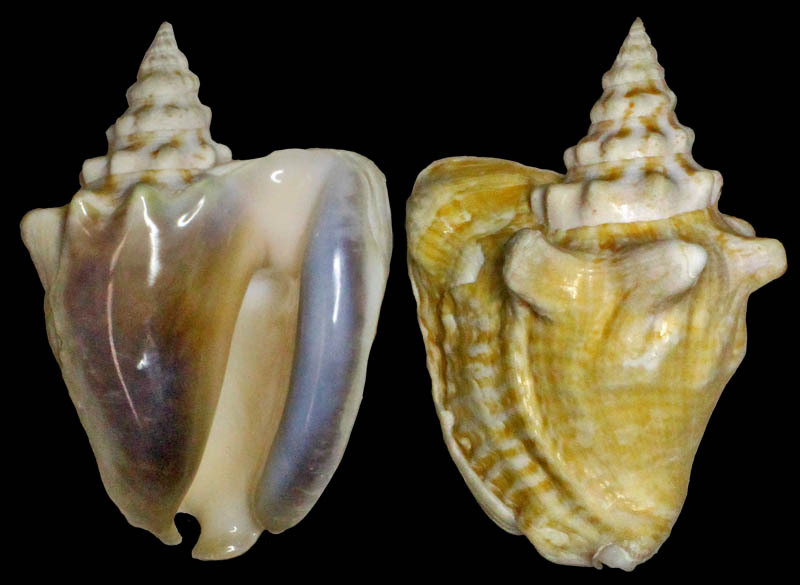 "The "Island Rule" and Deep-Sea Gastropods: Re-Examining the Evidence". PLoS ONE+ 5(1): e8776. Woon, G. L. (1983). Preliminary algal preference studies and observations of conchs, Strombus gigas L. and Strombus costatus Gmelin held in high density. Journal of the World Mariculture Society, 14(1‐4), 162-163. Work, R. C. (1969). 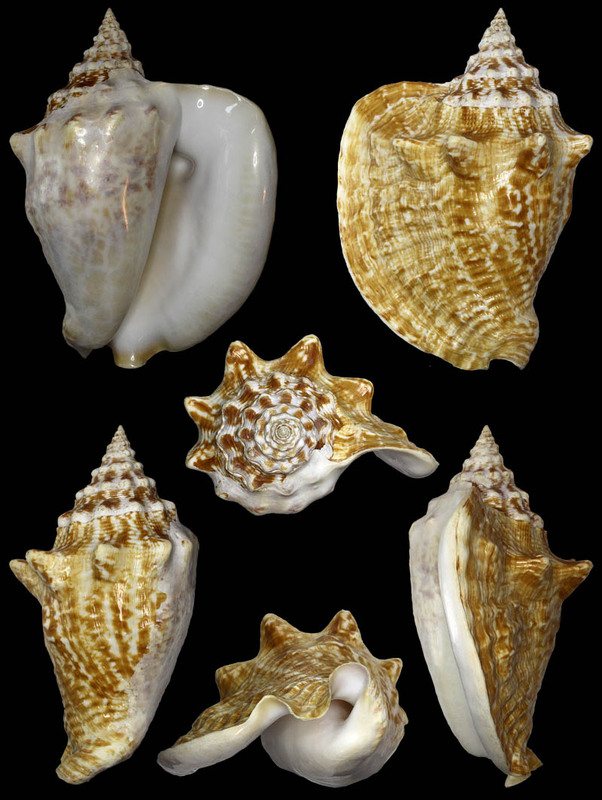 Systematics, ecology, and distribution of the mollusks of Los Roques, Venezuela. Bulletin of Marine Science, 19(3), 614-711.